It's Thursday and that can only mean one thing... it's Theater Thursday! Since we're in October it's a Halloween themed month of movies! This week's featured movie is, Scream. 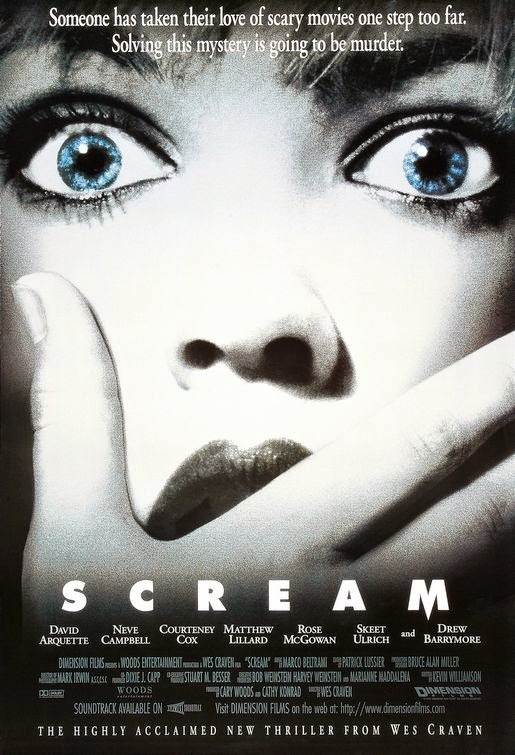 In 1996, Scream hit the big screen. Scream came to the box office when horror films had died down. There hadn't been a movie that really scared the teen generation of the time. That all changed as soon as Drew Barrymore hit the screen. Wes Craven brought a new story to the screen that related to teenagers. High school student Sydney Prescott (Neve Campbell) was going through a hard time. It was the year anniversary of her mother's brutal murder. Her dad was going out of town and her relationship with her boyfriend was rocky. In her sleepy, little town of Woodsboro everyone knew who she was because of her mother's death and the scandal that went along with it. When the town is shocked once again with the surprise double murder of two teenagers Sydney and the rest of the town are put on edge. Since her dad is away she's entrusted with her best friend and their family who includes a man in law enforcement. What Sydney learns very quickly is that these two teens murders have far more in common with her than she ever imagined. Now the killer has his eyes set on her and anyone else that comes along in his path. The town goes on lockdown, setting a curfew for all of it's residents. This is meant to protect them but will it? Who is murdering these teens and why? Who will make it through the weekend of this nightmare anniversary? Watch this classic horror film and find out who dies and survives. This movie launched all of the horror films that followed. There has even been 4 Scream movies made to date.